The undersigned is directed to say that the matter regarding extension of CGHS facilities to Central Govt. employees (serving/retired) covered under New Pension Scheme (NPS) was under examination in this Ministry. (a) Minimum years of qualifying service for eligibility of CGHS membership after retirement- 10 years. (b) No minimum qualifying years Of service for availing CGHS facilities in case of death/disability. 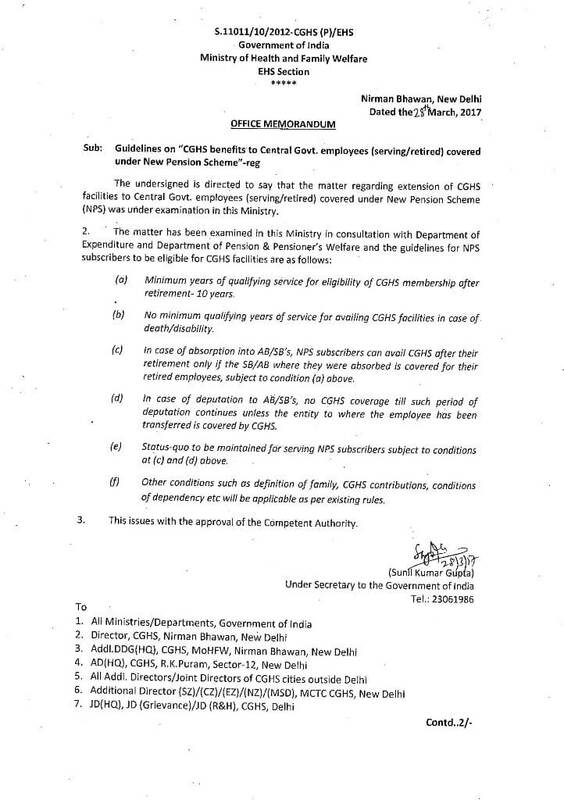 (c) In case of absorption into AB/SB’s, NPS subscribers can avail CGHS after their retirement only if the SB/AB where they were absorbed is covered for their retired employees, subject to condition (a) above. (d) In case of deputation to AB/SB’s, no CGHS coverage till such period of deputation continues unless the entity to where the employee has been transferred is covered by CGHS. (e) Status-quo to be maintained for‘serving NPS subscribers subject to conditions at (c) and (d) above. (f) Other conditions such as definition of family, CGHS contributions, conditions of dependency etc will be applicable as per existing rules. the matter regarding extension of CGHS facilities to Central Govt. employees (serving/retired) covered under New Pension Scheme (NPS) was under examination in this Ministry.